You can experience all that our beautiful city offers from within. 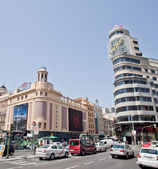 We are located in the center of it, in Madrid's Gran Via, the main avenue of the city and near by Plaza de Sol. In the area there are also plenty of bars, cafes, restaurants, where you can taste the delights of Spanish cuisine and varieties of the world. The main galleries of the center, are within meters walk, like Fuencarral, Chueca and the best cinemas and theaters in the capital of Spain. We can not say more of the city, it's up to you to discover it. There are many faces of Madrid to see. Be sure to visit us if you pass through the city, we are the best accommodation in the area value for money.